IT MUST have seemed like a good idea at the time. 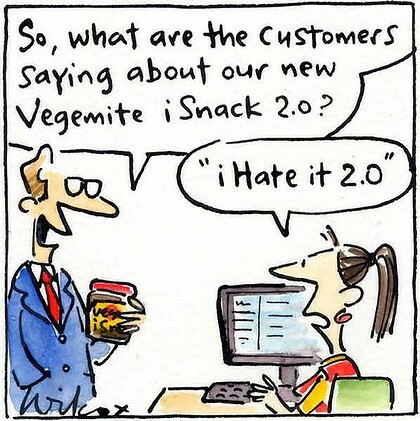 But no sooner had Kraft trumpeted the name of its new Vegemite variant, iSnack 2.0, than it was met with almost universal condemnation by customers. On Saturday, the internet bristled with indignation at the name chosen from 48,000 suggestions by Vegemite fans as part of a public relations campaign to name its new cheese-based spread. Courier is a real device, and we’ve heard that it’s in the "late prototype" stage of development. It’s not a tablet, it’s a booklet. The dual 7-inch (or so) screens are multitouch, and designed for writing, flicking and drawing with a stylus, in addition to fingers. They’re connected by a hinge that holds a single iPhone-esque home button. Statuses, like wireless signal and battery life, are displayed along the rim of one of the screens. On the back cover is a camera, and it might charge through an inductive pad, like the Palm Touchstone charging dock for Pre. The Australian Government has released a discussion paper that proposes to introduce online voting and drop the voting age to 16.The paper, “Strengthening Australia’s Democracy”, says it notes that many Australian 16-year-olds are contributing taxes and should be included in the electoral process.However it adds that voting would not be compulsory for 16 and 17-year-olds as it is for Australians over the age of 18. PLEASE TO WATCH – this is soooo funny. Quote Watched part of this march – I think America has finally caved in to the Crazies…..what a sorry bunch of ignoramus’! Quote IF YOU DON’T LIKE GLENN BECK READ THIS. Can a mere domain name be defamation? Glenn Beck says yesHugely popular conservative talker Glenn Beck has sicced his lawyers on a satirical website that’s been up for a week, but the attorneys may have a point on this one. The site, called glennbeckrapedandmurderedayounggirlin1990.com, toes the line on defamation—and may have stepped across it.